The press release for “A Dark Place” describes it as “a neo-noir thriller,” which unfairly set me up for disappointment. This is neither a thriller nor is it noirish by even the most charitable of genre definitions. If anything, it’s a conventional murder mystery with an unconventional lead character. 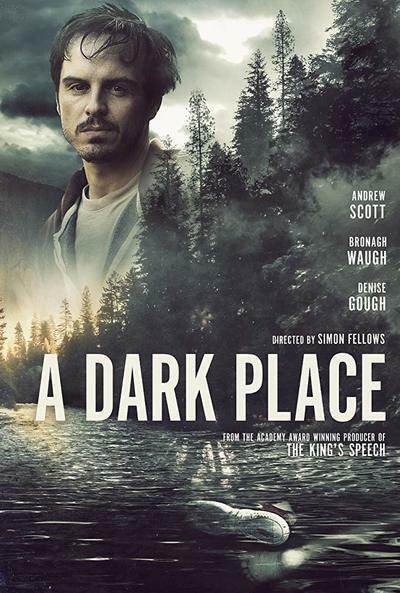 Garbage man Donald Devlin (Andrew Scott) is on the autism spectrum, and while the film respects his challenges and folds them into an ordinary life, the plot too often gives him an obvious boost vis-à-vis his attempts to solve the potential crime. Some of the things Devlin does would get anyone else arrested or murdered, and information is provided to him far too easily for those scenes to be credible. Quite frankly, the character deserved a more complicated and challenging mystery. Or even better, no mystery at all. “A Dark Place” is most effective when following Devlin through the standard drudgeries of life. In the fictional small town of Harbaugh, Pennsylvania, Devlin’s a garbage man whose wisecracking partner, Donna (Bronagh Waugh) constantly violates his intense sense of order. The job is a grind, but its routine nature provides comfort for a man who uses repetition to find calmness. When not in the truck, Devlin spends time with his 11-year-old daughter, Wendy. He’s quite the doting father; she adores him despite his penchant for embarrassing her as only uncool dads can. Devlin still carries a torch for Wendy’s mother, Linda (Denise Gough), with whom he had a drunken one-night stand. He’s even stayed “faithful” to her despite her repeatedly telling him she never loved him in the first place. When Devlin fails yet again to process the social cues Linda puts forth, her response is the film's best, most painful scene. Devlin also lives with, and cares for, his mother, reminding her to take her meds and always offering to roll her wheelchair in front of the TV before he heads out for work or play. Mrs. Devlin appears to be in the beginnings of dementia—at one point, she tells her son that his deceased Dad is coming home soon—and she’s always quoting the Bible to him. The one time Devlin responds with his own quote, it serves as the theme of “A Dark Place”: “The heart is deceitful above all things and without cure. Who can understand it?” Between this film and “Us,” the Book of Jeremiah is making a real comeback. But I digress. I’ve avoided discussing the murder mystery thus far because it feels like such a callous afterthought, a grasp for Meaning in a film about a small town whose main characters feel trapped within its borders. “Do you ever feel about jumping on, to see where it goes?” Donna asks Devlin of the train that runs through the town. “Or jumping in front of it,” she ominously adds. The town’s economy is dying as slowly as the spirits of its denizens. Plus, everyone loves the Steelers! Pittsburgh seems to be the big escape for folks who found a springboard to leave. It’s mentioned more than once as a counterpoint to Harbaugh life. Regarding Harbaugh: You can feel director Simon Fellows going for a “Blue Velvet”-like feel early on. One of the first shots is a vulnerable body part lifelessly depicted under shallow water. The body in question belongs to Tyler Zeigler, the little boy who always waved at Devlin whenever his truck came to collect the trash. We know he’s dead long before Devlin notices Zeigler’s brother posting “have you seen Tyler” on Wendy’s pseudo-Facebook wall. After learning of Tyler’s death, which has been ruled accidental, Devlin approaches Betty Zeigler (Sandra Ellis Lafferty) to offer condolences for her son. She responds by telling him that Tyler would never have wandered off. On that one detail, which may be apocryphal, Devlin assumes foul play. Why would Devlin trust her? He knows very little about the Zeiglers beyond Tyler’s friendly waves. We’re not even privy to those, so we know even less about these people. Writer Brendan Higgins relies too heavily on assumptions he expects us to make based on movies we’ve already seen. He also adds possible child abuse, molestation and domestic violence into the mix simply because very little needs to be done to elicit an emotional response. Yet none of this feels earned. We’re supposed to believe that the entire town may be involved in a cover-up, but not once do we ever feel a true sense of evil pervading. The “dark side” is more in the cinematography than in the details. Devlin’s unconscious need to brutally fixate on something that doesn’t make sense, sometimes to the point of madness, is a spectrum trait I share. So I really identified with his desire to at least restore order in his own mind. But people just give him information whenever he shows up. The investigator who was his lifelong friend, the kids who probably were told to stay away from “the town weirdo,” Wendy’s pediatrician and a slew of others just drop plot-advancing clues willy-nilly, encouraging Devlin to fall deeper down the rabbit hole by himself. It’s just too easy. I mean, would you buy this scene: A character Devlin never met is suddenly accosted by him at his place of business, and when Devlin asks if he were molested by the film’s villain, the guy immediately says “yes.” He’d tell something this devastatingly personal to a disheveled looking stranger he doesn’t know from a can of paint? Scott is very good here, as is Waugh as the sidekick who carries a torch for him. Scott’s performance is full of details that don’t seem exploitative, though they still fit the standard movie autism tropes. This is a better depiction than “Roman J. Israel, Esq.”, though the film I thought of while watching “A Dark Place” is Kasi Lemmons’ superior “The Caveman’s Valentine.” Granted, in that murder mystery film, Sam Jackson’s character was schizophrenic, but that movie used its main character’s unusual senses of perception in the same manner as this one. The mystery in Lemmons’ film is far more complicated, however; this one feels like its grading its hero on a curve.